Wearing a red hat or tee shirt while gardening may not be the best choice in a yard frequented by hummingbirds. They may buzz your head and shoulders in search of nectar, diving at a rate of 200 wing beats per second. Hummingbirds have a poor sense of smell but keen color vision. They seem to associate vibrant colors with nectar, especially reds. Tubular flowers, such as nectar-rich Salvias, are uniquely suited to their long skinny beaks and tongues. One species of Salvia that hummingbirds particularly love is the woody perennial Mountain Sage (Salvia microphylla), which offers a wide array of tempting rosy shades, including pinks, magentas, primary reds, and red-orange. Salvias, of course, don’t mind being buzzed by these tiny creatures that weigh no more than a penny. Hummingbirds are their best pollinators. Larger and more intrusive than bees, they collect more pollen from the blossoms. Hummingbirds help Salvias reproduce by inadvertently carrying pollen from one blossom to another. Except for butterflies, insect pollinators have a narrow range of color vision and especially don’t notice red. They rely on strong floral smell to locate the flowers where they feed. Salvias, of course, are known more for the fragrance of their foliage than their flowers. This means insects may bypass the opportunity to forage in red Salvias, leaving more sage nectar for hummingbirds. Hummingbirds are known for good recall of plants they have previously visited and found to be reliable sources of nectar. So they may associate the reds of Mountain Sage with a fine meal not to be missed. In constant overdrive, hummingbirds need lots of nectar. They flap their wings an average of 50 beats per second. Some species migrate thousands of miles, flying for hours at a time. So if you plant Mountain Sage in your garden, you are providing them with a good filling station. At Flowers by the Sea, we have noticed that although hummingbirds harvest nectar from all our Salvias, they prefer species from the Western Hemisphere. This may be due to the fact that the 328 known species of hummingbirds are, themselves, western species found only in the Americas. Mountain Sage is a drought-resistant species native to the dry, rocky lands of Southern Arizona and the mountainous areas of northern and central Mexico where it is known as “Mirto de Montes” or “myrtle of the mountains.” It blooms in spring and again in fall. Despite the aridity and high elevations of its homelands, Mountain Sage is adaptable to a broad range of climates and grows beautifully at sea level in humid coastal areas. 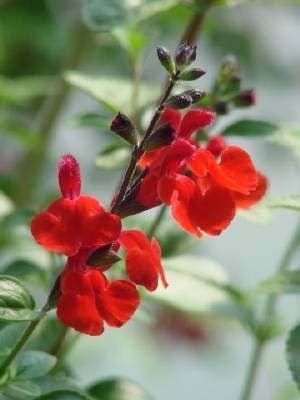 Depending on your viewpoint about accidental hybrids, its sole flaw may be the ease with which it crosses with other Salvias. So be prepared for surprises. Here are a few hummingbird favorites. Belize Form has bright red flowers that stand out dramatically in contrast to its stiff black stems. It enjoys partial shade in U.S. Department of Agriculture plant hardiness zones 8 to 9, but can also thrive in full shade. This tall but narrow variety reaches up to 48 inches high and 24 inches wide. Red Velvet is the most vivid red S. microphylla that Flowers by the Sea has found. It also has dark stems and can blossom in conditions from full sun to full shade. Zones 7 to 9 are a suitable home for this beauty, which grows 48 inches tall and wide. Mountain Sage doesn’t have to be red to attract hummingbirds. For example, they are drawn to the light purple flowers of Azure Hybrid Sage. It grows well in zones 7 to 9 and does well in full sun, but tolerates some shade in hot areas. As with so many aspects of life, the hummingbird-Salvia relationship is circular. It is difficult to have one without the other. Unfortunately, many species of hummingbirds are threatened or endangered. By planting Mountain Sage, you invite hummingbirds into your garden, expand their habitat and ensure pollination for abundant blossoming. Need more information about FBTS hummingbird plants? Please contact us. I just received my 1st order of plants and I am thrilled by the condition and by the quick delivery time. Spectacular service.May I suggest that you include your excellent print out on after- care of plants upon receipt with orders.